That's pretty awesome. Good job! Good to see you Qrab! I have never appreciated the Chaos archers as much as I do now with your great paintjob (except for the two on the right of the second rank - like you said they need a chemical bath - just dont look as polished as the rest for some reason. But otherwise great! Wow, that's impressive! Great stuff! Great stuff Qrab. I love what you do with the bases. I tried joining the Oldhammer Challenge but missed it by a day or two. I'm still dedicated to the challenge of painting 200pts a month and so far so good. So the painting challenge ended in April with wrap up posts in May. I managed to paint something for each month of the challenge, so now have the start of a new army. You can read all about my experience here: http://oldworldarmychallenge.blogspot.com/search/label/Qrab. That is a wonderful project for that challenge, well done! Re: Qrab’s oldhammer painting - Empire edition! 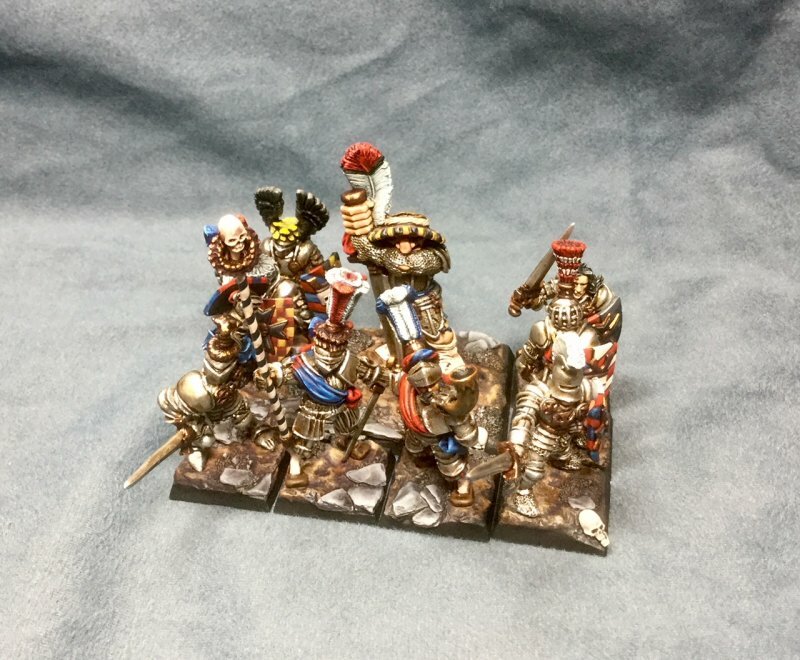 So the second Old World Army Challenge started in January and this time around I plan on painting an army more in keeping with the focus of this forum - Empire! Here’s a link to my January contribution. Most of the models are from the 80s, with a couple from the mid 90s. Great to see these here! Thanks! They were a lot of fun to paint. I’m pretty sure Iannick is going to keep my his going. It’s never to,early to start prepping for the next one. Uuuhh... It's THAT set of figures! They surely look ace, but maybe take a close-up in a more favourable light? Go to the blog link. More pictures there. Despite having to be out of town for work for most weeks of the month, I painted some more miniatures in February. Here’s a link to my blog post on the subject. Thanks! I really like how characterful the sculpts are. Fantastically characterful models with superb paint jobs. Well done! The Bergjaeger are excellent! Classic goodness. Beautiful work! Love that Imperial Ogre!